Cones. Lots of them! I use 9 to outline the zones, plus you’ll need up to two for each zone to show which team hits which zone. Overall, 20 cones is ideal. But you may be able to get creative and use other markers to mark zones! 1 volleyball per player. Give each girl her own volleyball to use throughout the drill. Have them shag the ball so there are not a ton rolling around. Split your team into two groups. You can take one of two approaches here: 1) split them evenly as best as you can. Make sure each team has a strong server who can likely hit each zone, or 2) let them split into their own groups. Honestly, I prefer the second approach, because when they’re having fun they can surprise you! Have each player grab a ball, and while they’re doing that, you’ll be outlining the zones of the court on the opposite side. Do a quick review of zones by standing in each zone and having your players call out which number the zone is. Group 1 will begin serving from behind the right back area of the court, and group 2 will serve from behind the left back area. OK! You’re ready to get started! Set a timer and declare a winner after time runs out (I like 4 minutes for this drill). 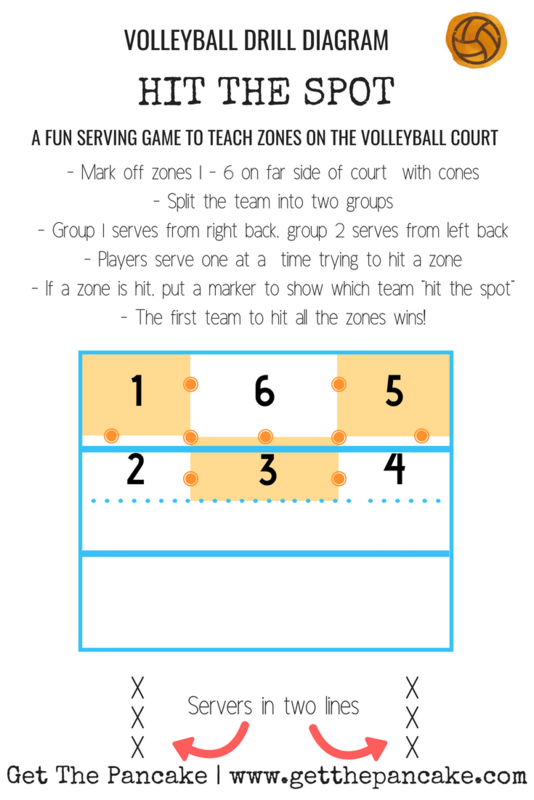 I recommend setting a timer if you have a younger team or beginner volleyball team, that way it can still be competitive regardless of how many zones your team hits. You can do best two out of three if the groups seemed competitive, or mix up teams for three rounds. To mark which zones are hit by each team, I designate one team as a cone standing upright, and another as an upside down cone. This gives them a quick visual. I have also invested in different colored cones for my teams, which I’ve found helps when I run drills like this one. I use orange to outline the zones, and green to mark which ones they’ve hit. You could get creative by putting colored paper in zones (purple for group 1, white for group 2), or maybe different colored volleyballs… I’m sure you’ll think of something if you don’t have cones! Maybe you could give your team a set number of serves to hit all of the zones to really increase the pressure. If they only get 15 serves, each serve counts! You could also have the drill running on two sides of the court if you have a large team or if you’re running this for a camp. I would recommend each side having a coach to mark the zones which are hit, but you could also give a stack of cones to each group and they mark their own zones. For more advanced teams, make them serve in a certain order or pattern. For example, have them serve zones 1-6 in order. Or Have them alternate between deep and short, so it would go 1, 2, 6, 3, 5, 4. Create different challenges and write them on a whiteboard for quick reference. Good luck! I hope your team enjoys this drill as much as my teams have!